For years, Sitka High School baseball coach Ed Conway tried without success to work out a plan that would restore his team’s eroding baseball and softball fields. So he went to his power lineup. Ed tapped into the services of Alaska Marine Lines, Arrowhead Transfer and a handful of city and political administrators to help him build his field of dreams in Sitka this past summer. He recruited Senator Bert Steadman of Sitka and Representative Bill Thomas of Haines to aid his cause. The elected officials helped secure a $2 million state grant that brought the dream one step closer to realization. He then worked with Arrowhead Transfer’s Vice President of Operations Paul Haavig and Alaska Marine Lines who reduced the shipping rate on 1.2 million pounds of freight to bring the materials from Seattle. Suddenly, the long-time dream became reality. 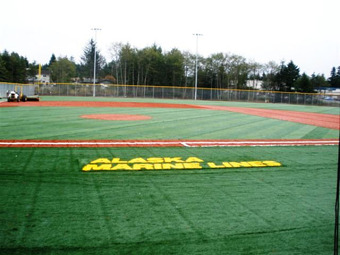 The final result was a newly carpeted baseball and softball field complex – Moeller Field – with a permanent Alaska Marine Lines logo imprinted on the turf as a show of appreciation from the high school. The fields will be used for Sitka high school baseball and softball, community little league teams and men’s and women’s community softball. The new venue was officially dedicated in a ceremony on Alaska Day. Paul was in attendance with Steadman, Thomas, Alaska Marine Lines President Kevin Anderson, Arrowhead Transfer President Gordie Harang, Sitka Mayor Mim McConnell and approximately 75 others, many of them ballplayers and construction workers on the project.